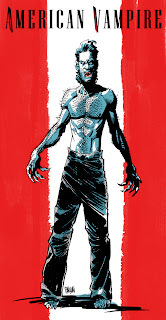 One of my favorite comic books right now is Vertigo Comics' American Vampire. Love the work by Snyder and the art by Rafael Albuquerque and Sean Murphy! I'd like to see a 50's/60's story set in the Midwest or SoCal! Thanks for the great pick Andy! Nice work. I too have been enjoying American Vampire. Awesome, sir. This could be a cover!